It’s unlikely that you could find a better first destination in Asia than Bangkok, Thailand. For people from the Americas or Europe or Australia, Bangkok is a perfect introduction to this enormous continent because it looks very exotic yet very familiar at the same time. You’ll be within sight of several temples or at least traditional Thai architecture just about anywhere you look, yet you’ll literally also be within 100 meters of a 7-Eleven (more likely 2 or 3 of them) at any given time, where you can buy a Slurpee or a hot dog (without a bun, usually) or a cold beer for a modest price. For the tourist, Bangkok can be somewhat compact. 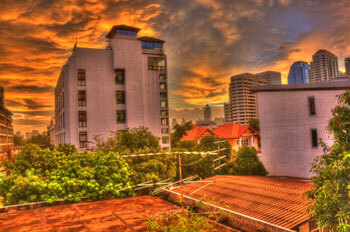 You’ll have the area near Khaosan Road and near the river where you can find nearly all the famous attractions. And a few kilometers away you have the area around Siam Square, which literally has 20 or 30 Western-style shopping malls filled with stores you recognize. There’s also the “adult entertainment” district centered around Patpong, which is fairly close by. However, for the expat or resident, Bangkok is enormous, not unlike London or Berlin or Los Angeles in that it just goes on and on almost forever. 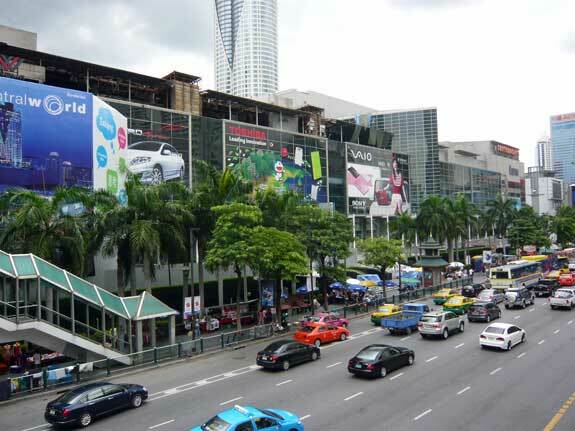 In fact, the most notorious expat area is along Sukhumvit Road, leading away from Siam Square. It gets a little cheaper the farther out you go, so English teachers and others on a tighter budget tend to end up quite a way from the city center. 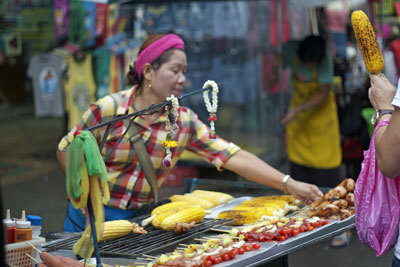 Among the many charms of Bangkok is the street food scene, where you have clusters of food stalls every few blocks, always preparing fresh food at amazingly low prices. One major reason for this is the combination of the year-round (and round-the-clock) heat in Bangkok and the small and simple kitchens that Thai people tend to have. In other words, it’s difficult or impossible to grill a chicken yourself at home, so many many people eat most meals from the food stalls. You can get a couple of pieces of chicken and a bag of sticky rice for around US$1, and a big bag of spicy salad for even less, often within 50 meters of your home. Another thing that makes Bangkok an ideal first stop in Asia is that most signs that are important are also in English (or sometimes only in English), and it’s very easy to get by without speaking a word of Thai. Needless to say, if you are going to stay for more than a couple of months it is wise to learn some Thai as a way of getting a deeper experience, but no one will really expect you to speak Thai. Due to the huge number of foreigners (farang) living there, all the merchants will speak at least a few English words in order to sell you whatever it is they sell. In many other Asian cities, things can be a real struggle unless you are staying in a tourist hotel and visiting attractions. It’s also worth noting that even though taxis are very cheap in Bangkok, it’s very important to choose a place to live with the whole transportation picture in mind. The Skytrain and the subway only cover a few thin parts of the city. Street traffic is horrendous so you really don’t want to need to go longer distances with a car or taxi because it can take forever. Bangkok is very cheap compared to most of the rest of the world, yet it’s relatively expensive for Southeast Asia. Apartments built for foreigners (with air conditioning, something of a kitchen, and a Western bathroom) start at around US$300 per month and go way up from there. To live near the central part of Sukhumvit you’ll likely be paying US$500 or more, and if you want something luxurious you could pay at least double that. You’ll also be paying extra for electricity and air conditioning can add maybe US$60 to US$100 per month to your bills, especially March through May when it’s hottest. One great thing is the food situation, as mentioned above. Even if you are living in one of the more expensive neighborhoods, it’s fairly easy to eat 3 meals per day from the food stalls for around 100 baht total (US$3) per day. You’ll also have an endless list of familiar fast-food and other restaurant options that charge prices maybe a bit cheaper than in the US or Europe, but the street food is cheap and literally available around the clock. Drinking isn’t as cheap as it is in other parts of Southeast Asia. A beer from a 7-Eleven is around US$1, and in a bar it’s about $3 or more. Wine and spirits are even more expensive, except for the locally produced rice whiskey that some people aren’t fond of. In some ways Bangkok might be the best shopping city in the world because in addition to local outdoor markets selling local items, and the countless shopping malls in the middle of the city, you’ve also got hypermarkets that offer cheap goods and are like shopping malls themselves. At the Tesco Lotus markets (and whoever is buying the old Carrefour chain) you can buy food or household goods or clothes or just about anything else you can think of at rather low prices. Living near one of these places is worth more than you might think, so it’s good to map them out when you are looking for housing.